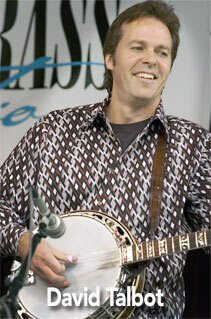 David Talbot has become one of the most respected banjo players in the music business, by both peers and fans alike since his move to Nashville Tennessee in 1998. His noted precise timing, finesse and tasteful playing has captured the attention of fellow artists, who have invited him to work on a large number of recordings and performances. David contributed to Lonesome Standard Time’s Grammy nominated “Murder On Music Row”. As well he was a founding member of IBMA’s Entertainer of the Year “The Grascals”, recording two Grammy nominated albums for Rounder. He also appears on 2007 Grammy nominated recordings by Dolly Parton and Jim Lauderdale. David has appeared on numerous bluegrass, country and americana releases. He played on the classic “Bluegrass Fiddle Album”, winner of IBMA’s Instrumental Album of the Year. He has recorded with Reba McEntire, Tony Rice, Larry Cordle, Sam Bush, Kenny Chesney, Dierks Bentley, Bryan Sutton, Aubrey Haynie, Marty Raybon and many more. David has appeared on both Letterman and Conan O’Brien’s network television shows with the legendary Dolly Parton. He has played on numerous Parton recordings, including the current Grammy nominated soundtrack “Travelin’ Through”. David’s pristine musicianship caught the attention of Ms. Parton, who has invited him to be a full-time member of her “Mighty Fine Band”. He now tours with her extensively both nationally and abroad.